Winter has finally arrived here in Nebraska; from mid-50 degree F weather just a few days ago, we hit a chilly low of 1 degree F early this morning. Even some of the local youth actually abandoned their gym shorts for jeans, surprising as that may seem. 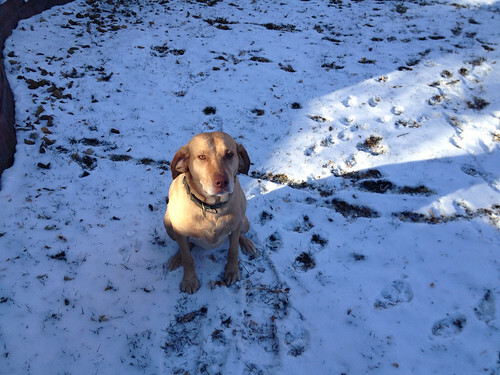 Trying to make it up to Ginger-the-dog for not having gone on an outdoor walk these past few days, I took her out for a 15 minute walk and we both returned nearly frostbitten. In the lab and my office, however, things are heating up. Preparations for the annual American Society for Cell Biology meeting which I will attend with 2 of my students, this year for the first time in New Orleans. Posters. Student fellowship applications. Teaching. Writing exams. Grading exams. Reviewing papers. Writing papers. Reviewing grants. Writing grants. Committees. Meetings. More committee meetings. And so on. But the science is exciting, and despite the dismal odds at getting grants funded these days, the adrenalin of novel discovery spurs me on. These are also exciting times for me, as I’ve blogged recently about the launch of my new Lab Lit novel, A Degree of Betrayal. Subsequent to my Occam’s Corner promotional blog last week, I found myself in the rare and somewhat surreal position of being sold-out and having to put potential paperback sales on ‘back order.’ For those interested in aspects of publishing, especially with a small publishing company, it is interesting how this situation arose. To start with, some statistics: I launched an upgraded personal website in conjunction with publishing the novel. I previously had an antiquated system with a counter (to measure traffic) that might have been designed in the middle ages. So when I was offered a system that uses WordPress, just like our own Occam’s Typewriter–with proper statistics and a host of other advantages–I grabbed it. I found that preceding the book launch, I was averaging ~50 visitors and 75-100 visits per day. However, as surprising as it may seem (and despite the usual droll troll comments), at least several people must have actually read my post–and then, actually taken time to click onto my website–and even–yes even–purchase copies of the novel. Paperbacks and Kindle. In fact, one week after my Guardian post, statistics show that I racked up well over 150 referrals that indicated visits directed from The Guardian post. More spectacularly was the huge boost in daily visitors and visits at my site, which climbed to about 200 visitors and 250 visits by the end of the day. Graph demonstrating an increase in visits on the day of the Guardian post; at the time I did this screen-save, we were only 3/4 of the way to the peak. Although I didn’t take another screen shot since last Friday, this effect has continued to stimulate swelling all week (about 2-fold above the ~50 visitors/day), although things are gradually decreasing back to pre-Guardian post levels. Now, unlike the situation with my previous novels, my publisher strongly encouraged me to sell autographed copies from home (in addition to Amazon sales, of course), because this is the most profitable method of sales. Indeed, the royalty for me on a self-sold novel reaches $8, in the absence of any discount. (Which reminds me, I offer paperback versions of A Degree of Betrayal for $12 for any of my Occam’s Typewriter friends or readers–just use “OT” as your code…). But back to the narrative: I found myself very quickly, and unexpectedly without any stock to provide for customers. So I hurriedly had my publisher order another 4 boxes (about 100 books), and I waited with growing anxiety for the United Parcel Service (UPS) to deliver my books. The last thing I wanted was for readers to cancel orders because they were afraid they wouldn’t arrive on time to be given as holiday gifts. I carefully tracked the books as they shipped from Charleston, South Carolina and moved west toward the great plains. And everything moved smoothly, on schedule. But then–I suddenly noticed that the address listed for delivery was inaccurate–it was missing my street number. Oh no! But that should be easy to fix–with such an organized, digitized and efficient system such as UPS. Just call in and correct the address–or even do the online chat thing, right? Wrong! It turns out that the incorrect address cannot be changed until it is actually out on a truck for delivery (don’t ask me why-it doesn’t make any sense). And if one misses that special and narrow window–oops, the package may end up getting shipped back to Charleston. Many phone calls and many online chats later, I finally managed to get them to HOLD the shipment at the UPS facility way out at the south eastern tip of Omaha, so that it would NOT go out for delivery (to the wrong address). My plan, brilliant as it was, was only met with partial success. I showed up at the facility in the morning, anxious to collect 4 boxes of my novels and head off to the lab. Inside, I showed my ID and received a single box. “Where are the other 3?” I asked. “On the truck” was the answer. Why, when I put a hold on it? Would that mean I’d have to keep showing up at the facility to try and track my other boxes every day lest they be returned to Charleston? 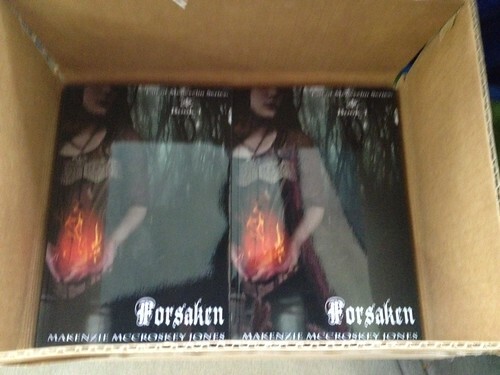 When I arrived home later that day, wondering if there would be: a) no delivery, b) delivery of 3 boxes of A Degree of Betrayal, c) delivery of 3 boxes of “Forsaken,” I found that the correct answer was none of the above. 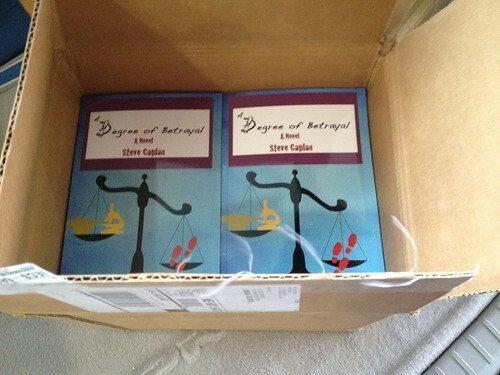 On my porch sat no less than 6 boxes: YES, my other 3 boxes of A Degree of Betrayal had arrived! But along with them, so had 3 more boxes of books by the YA author. Jasmine O.: Hi, this is Jasmine O.. I’ll be happy to assist you. Jasmine O.: Thank you for bringing this to our attention. May I please have the tracking numbers? steve: Of the return labels? Jasmine O.: Yes, may I have one of the tracking numbers from the return label? Jasmine O.: Thank you. Just a moment while I look into that for you. Jasmine O.: I have checked and it seems the company CREATESPACE has pre paid the shipping charges for the packages, however the pickup charge has not been covered. A pickup can be scheduled for a fee. The pickup charges can actually range between $5.00 to $14.00, depending on the location for pickup and the pickup date. Also the packages can be dropped off at a UPS location or if you happen to see a UPS driver you can hand him or her the packages at no cost. Jasmine O.: Have you had enough time to review the information? steve: Well, I did not make the error. It’s not my package, so I don’t intend to pay anything, and the boxes are heavy, so I am not going to lift them. Jasmine O.: I completely understand that. In this case, I can suggest contacting the company CREATESPACE, to see what other options they can offer you. One must understand that my publishing company, Big Table Publishing Company, has the books physically printed by another company called CreateSpace, which is owned by Amazon. And my publisher was the one who brokered the deal to get the UPS labels for me to return the books. At this point, the boxes of the YA book are clogging up my front hallway. Being Steve, I penned an email directly to CreateSpace, hoping that this might spur them on to pay UPS to come and pick up their books. Thank you for sending me the UPS labels to return the 4 boxes of books that don’t belong to me. However, when I called UPS to ask if they could come tomorrow to pick up these boxes, they wanted to charge me between $5-14 for this service, and noted that CreateSpace had not paid for this and I would be responsible for this cost. Allow me to remind CreateSpace that I notified you of the mistaken delivery of these boxes out of my desire to be a good citizen. They do not belong to me, are in no way connected to me, and are not a result of any error that I have made. Accordingly, I have no intention of paying UPS to pick them up. Furthermore, these boxes are heavy, and I have back problems and do not intend to carry them to a UPS pickup point or to the Omaha UPS facility. I have already spent over 25 minutes today of my own valuable time trying to reach UPS on the phone to confirm a pickup that they will not do. Please decide quickly what you would like to do, as I will be leaving town in a few days and will not be back until after the new year. If you would like to arrange a UPS pickup, I will be happy to affix the labels on the boxes and drag them out to my porch for pickup. But at this point, I leave the coordination in your hands with UPS, as I do not have time to spare to make these arrangements over the phone. Email me and let me know what day to put the boxes outside. If I don’t hear back, I will assume that you are not interested in their return. Thank you for contacting us with regards to returning an incorrect shipment. I was unable to find any recent orders placed on your account. Please provide us with the order number so we can better assist you with this. I sincerely apologize for the inconvenience. As always, please do not hesitate to contact us if you have any additional questions or concerns; our Member Services team would be happy to assist you. Well of course I don’t have a bloody order number, I didn’t order 100 YA books, did I? I feel sorry for that author, but what can I do? I await instructions from the mother of all publishing bureaucracies. This entry was posted in Education, research, science and tagged author, betrayal, books, lab lit, Nebraska, novels, omaha, publishing, research, science, writing. Bookmark the permalink. The Chaos-driven universe sends out another joke email! You just can’t make this stuff up. Idiocy Unawares is becoming an art form, everywhere incompetence is served. If it hasn’t dished you a huge dose of adrenalin, it makes for some good laughs. Thanks for sharing this.